The NRAO headquarters is located on the campus of the University of Virginia in Charlottesville, Virginia. The North American ALMA Science Center and the NRAO Technology Center and Central Development Laboratory are also located in Charlottesville, Virginia. The 100 meter Green Bank Telescope. 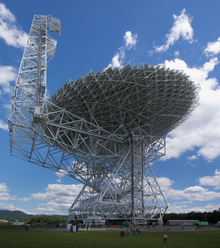 NRAO was, until October 2016, the operator of the world's largest fully steerable radio telescope, the Robert C. Byrd Green Bank Telescope, which stands near Green Bank, West Virginia. The observatory contains several other telescopes, among them the 140-foot (43 m) telescope that utilizes an equatorial mount uncommon for radio telescopes, three 85-foot (26 m) telescopes forming the Green Bank Interferometer, a 40-foot (12 m) telescope used by school groups and organizations for small scale research, a fixed radio 'horn' built to observe the radio source Cassiopeia A, as well as a reproduction of the original antenna built by Karl Jansky while he worked for Bell Labs to detect the interference that was discovered to be previously unknown natural radio waves emitted by the universe. Green Bank is in the United States National Radio Quiet Zone, which is coordinated by NRAO for protection of the Green Bank site as well as the Sugar Grove, West Virginia monitoring site operated by the NSA. The zone consists of a 13,000-square-mile (34,000 km2) piece of land where fixed transmitters must coordinate their emissions before a license is granted. The land was set aside by the Federal Communications Commission in 1958. No fixed radio transmitters are allowed within the area closest to the telescope. All other fixed radio transmitters including TV and radio towers inside the zone are required to transmit such that interference at the antennas is minimized by methods including limited power and using highly directional antennas. With the advent of wireless technology and microprocessors in everything from cameras to cars, it is difficult to keep the sites free of radio interference. To aid in limiting outside interference, the area surrounding the Green Bank observatory was at one time planted with pines characterized by needles of a certain length to block electromagnetic interference at the wavelengths used by the observatory. At one point, the observatory faced the problem of North American flying squirrels tagged with US Fish & Wildlife Service telemetry transmitters. Electric fences, electric blankets, faulty automobile electronics, and other radio wave emitters have caused great trouble for the astronomers in Green Bank. All vehicles on the premises are powered by diesel motors to minimize interference by ignition systems. The Very Large Array (VLA), an array of 27 dish antennas. 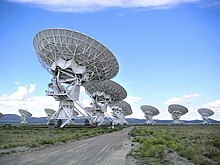 The NRAO's facility in Socorro is the Pete V. Domenici Array Operations Center (AOC). Located on the New Mexico Tech university campus, the AOC serves as the headquarters for the Very Large Array (VLA), which was the setting for the 1997 movie Contact, and is also the control center for the Very Long Baseline Array (VLBA). The ten VLBA telescopes are located in Hawaii, the U.S. Virgin Islands, and eight other sites across the continental United States. Offices are located on the University of Arizona campus. NRAO formerly operated the 12 Meter Telescope on Kitt Peak. NRAO suspended operations at this telescope and funding was rerouted to the Atacama Large Millimeter Array (ALMA) instead. The Arizona Radio Observatory now operates the 12 Meter Telescope. The Atacama Large Millimeter Array (ALMA) site in Chile is at ~5000 m (~16,500 ft) altitude near Cerro Chajnantor in northern Chile. This is about 40 km (about 25 miles) east of the historic village of San Pedro de Atacama, 130 km (about 80 miles) southeast of the mining town of Calama, and about 275 km (about 170 miles) east-northeast of the coastal port of Antofagasta. On 12 May 2012, another Atacama Large Millimeter/submillimeter Array (ALMA) antenna was carried up to the 5000-metre plateau of Chajnantor, bringing the total on the plateau to 33. The Karl G. Jansky Lectureship is a prestigious Lecture awarded by the Board of Trustees of the NRAO. The Lectureship is awarded "to recognize outstanding contributions to the advancement of radio astronomy." Recipients have included Fred Hoyle, Charles Townes, Edward M. Purcell, Subrahmanyan Chandrasekhar, Philip Morrison, Vera Rubin, Jocelyn Bell Burnell, Frank J. Low and Mark Reid. The lecture is delivered in both Charlottesville and in Socorro. ^ NRAO Green Bank Site RFI Regulations for Visitors. ^ "Halfway There: 33 ALMA Antennas on Chajnantor". ESO Announcement. Retrieved 15 May 2012. Wikimedia Commons has media related to National Radio Astronomy Observatory. This page was last edited on 29 January 2019, at 19:33 (UTC).